This is a guest post from AllVictories, my favorite JewishMOM blog…(and yes, this is a real-life photo of Chaya that I loved). Enjoy! But on this particular morning, A.N. had woken up before her siblings, dressed herself and was now padding around the apartment, thinking aloud. “Some people just keep being outside and they don’t go home,” she observed. I was interested. “Where do they go?” I asked. “Would you like to keep going to faraway places?” I asked. As soon as my daughters were born, I was worried about playing favorites. Twins are always being compared to each other—by their parents, by people around them, and ultimately by themselves. I was so afraid to prefer one over the other, to love one more. My wise friend Tikvah told me, “You will probably go back and forth between preferring one over the other.” She was right. And that helped me relax and learn to love them equally by ardently preferring one at a time. And now I have B.A., and I love him with a suffocating kind of adoration that is somewhat like romantic love. He is two years old and change, and he stays home with me while his sisters are at preschool. Whatever we do, it feels like we are on a lovely adventure together. And I carry on in a silly way because he is around, dancing around like crazy and climbing on top of things to amuse him. He is my only boy, and my only singleton, and he is snuggly and wonderful. Y.B. is so much like I was as a kid, and so much like I am now. She is also very much like my so-much-loved husband. Of course, she is also new and fully herself, but there is something magical in experiencing those resonances all the time. I love her depth and her hypersensitivity. I feel like I understand more completely than I do my other children. But A.N. is from another planet altogether. She doesn’t even look like us, a little storm of recessive traits. She has blue eyes that spread over half her small elfish face. She has a distinctive way of dressing that delights me even as it generates so much extra laundry: skirts over pants, tunics over dresses, layered shirts. Even though I buy her clothes, I’m always surprised and pleased by her combinations of colors and patterns. She wants her hair worked into as many pigtails as I can fit on her fine blonde head. She is intense. She loves experiences—spinning until she is dizzy, the feeling of different fabrics on her skin. She has a raucous and subtle sense of humor for a four-year-old, and she throws her head back when she laughs. She likes to kill bugs and to walk in high places. Nothing scares her, but she’s always worried that I’m not taking care of things properly. Her baby brother didn’t interest her at all for the first two years he was around, but recently she started doting on him and doing little things to please him. The other day, she went to wake B.A. from his nap, and she brought his crocs with her so he could put them on as soon as he got out of bed. Everyone told me that she would be less emotionally explosive when she learned to talk. But instead, she is just as dramatic, but more articulate. She will declare in the midst of a tantrum, “I really really wanted to pour the syrup myself, and THAT’S why I’m SO upset.” She knows her mind. A.N. is fun to parent. Her reactions, her impulses, her thoughts are so mysterious and exciting to me even four years into knowing her. She’s resilient and delightful, and I enjoy taking her to shop for clothes and housewares. She has a good eye and strong opinions. We like the same things—music, language, art, clothes and pretty objects. But she doesn’t think like I do. Her perspective on the world is foreign and interesting. She remembers everything. It’s terrifying. When I am with A.N., I think that I love her best, and there is no way I can love her brother and sister as much. And then I spend an afternoon with Y.B., and I feel the same way about her for completely different reasons. Then the two of them head off to gan in the morning, and I am relieved to be alone with my beloved little boy. Just like Tikvah predicted—and she only had one child at the time!—I don’t love them all the same. Rather, I prefer one of them over the others all the time, but it always shifts. There’s an intimacy in that feeling of exclusive love, something so different from the cool professionalism of impartial mothering. Of course, I still worry that my favoritism will settle permanently on someone’s head. Perhaps it will; it’s not entirely under my control. Still, I try to give each child what he or she seems to need. And I try all the time to carve out little bits of time alone with each one to experience his or her strange specialness. There’s a lot to discover. I love and identify with this post. I like the way you are able to admit to loving one more than the other at different times. I was always afraid to admit it and never even thought about it. What I also liked is hearing about the child that you thought would be less explosive when she learned how to talk and she’s just as dramatic now. I have a child like that and I’ve always looked at that trait in a negative way and wondered what I’m doing wrong that I can’t get her to stop screaming over everything. She just turned 4 and it scares me cuz she’s getting older and still breaking into tears over every frustration. So I liked the positive twist that you put onto it – thanks, it’s helping me look at it in a different way. sometimes i think i am settling on a favorite, when suddenly i experience a wonderful new aspect of a different child and i am reassured that i just can’t play favorites. Chaya, your little daughter sounds just like me! 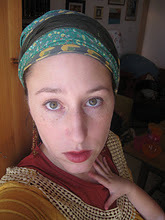 I stopped letting my mother dress me before I was two, stopped going to public school (I come from a secular, intermarried family) when I was 13 in favor of “homeschooling” and spent a few years learning torah, cooking, sewing and languages ferverently, with the full intent of moving out at around 15. Of course, she is also new and fully herself, but there is something magical in experiencing those resonances all the time.